A Mass of Christian Burial for Msgr. Eugene A. Feldhaus, a retired priest of the diocese, was celebrated at the Immaculate Conception Center in Douglaston, Aug. 27. He died Aug. 21 at the Bishop Mugavero Residence, Douglaston. He turned 98 years old last month and was the oldest priest in the diocese. Born in College Point, he attended Cathedral College, Fort Greene; Immaculate Conception Seminary, Huntington, L.I. and St. John’s University, Jamaica. He was ordained to the priesthood by Bishop Thomas E. Molloy on June 15, 1946 at St. James Pro-Cathedral, Downtown Brooklyn. He served as an assistant at St. Peter and Paul, Williamsburg, 1946, and St. Hugh, Huntington Station, L.I., 1947. In September, 1947, he was appointed to the faculty at Cathedral College, Brooklyn, and then Cathedral College in Douglaston, 1967-76. He taught English and speech, and moderated the St. Thomas More Society. He also served on the faculty of St. Joseph College for Women, Clinton Hill, 1948-53. 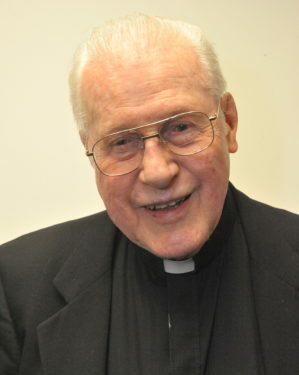 For 25 years, he served as pastor of St. Gregory the Great, Bellerose, 1976-91. In retirement, he lived in residence at St. Gerard Majella, Hollis, 1991-2005, and Incarnation, Queens Village, 2005-08, until he moved to the Bishop Mugavero Residence. He was named a monsignor in 1982. Auxiliary Bishop Raymond F. Chappetto was the main celebrant of the funeral Mass. Special concelebrants included Msgr. Frank Caldwell of Cure of Ars parish, Merrick, L.I., who preached the homily; Msgrs. Fernando Ferrarese and Steven Ferrari; and Fathers Joseph Cunningham and James Tighe. “He was like a second father to me and many priests who were his students at the college seminary,” said Msgr. Ferrari, pastor of St. Teresa, Woodside, who preached at the Mass of Transferal. He remembered Msgr. Feldhaus as someone who was interested in and concerned about each person he met. “As my, and many others’ spiritual director and mentor, he was ‘alter Christus’ – another Christ to us. He was prayerful and he loved the Lord Jesus,” Msgr. Ferrari said. Msgr. Feldhaus is survived by four generations of nieces and nephews. In lieu of flowers, donations to Catholic Charities in Msgr. Feldhaus’ name would be appreciated by his family. May you rest in peace, Father. We who attended Cathedral and knew you always had a deep respect for your wisdom ands devotion to the service which the priesthood involves. A lesson for all times, especially today.